If you have pain in the bottom of your heel, the odds are pretty good you have plantar fasciitis. In this condition, pain is often sharp and most intense when you take your first steps on the day. The pain is caused by an inflamed band of connective tissue running along the bottom of your foot, connecting the heel to the forefoot. This tissue—the plantar fascia—is rather durable, but excessive strain or stress (particularly from overuse) can cause tiny tears in it. Pain in the back of the heel is typically a case of Achilles tendonitis. Your Achilles tendon connects the base of your calf muscle to the back of your heel bone. This tendon is the largest and strongest in your entire body, but it can become inflamed when either subjected to overuse or sudden, intense bouts of physical activity. The Achilles does weaken over time, so we are more likely to see this injury in middle-aged patients, especially those who lead fairly sedentary lives during the week, but participate in competitive athletic competition (rec leagues, pickup games of basketball, etc.) on the weekends. Eccentric heel drop. Start by facing a set of stairs and then step up on the bottom stair. Standing on the edge—with only your toes and balls of feet being on the stair, and your heels hanging over the edge—slowly lower both heels down and hold for 10 seconds. Then raise them back up to the starting position. Repeat this 10-15 times. Calf stretches. Stand about an arm’s length in front of a wall and place your palms on it. Take a step forward with your right leg. Keeping your left knee straight and heel on the ground, bend your right leg slowly until you can feel a gentle stretch in your left calf. Hold the position for 20-30 second, release, and then switch legs and repeat. Toe stretch. For this stretch, start by sitting in a chair and raising your right leg so the foot rests on the thigh of your left leg. Grab your right foot’s big toe and gently pull it back toward you until you feel a stretch. Once you do, hold the position for 20-30 seconds, and then release. Switch legs and stretch your other one. Making sure you wear the proper footwear. Your shoes need to fit well, and be both activity-appropriate and well-constructed. Choose models that feature ample cushioning in the heel area, along with robust arch support. Doing more low-impact activities. Running and jumping can cause and exacerbate heel pain when done on a frequent basis. You can stay active—and give your heels time to recover—by swapping out a couple of high-impact activities for cycling, swimming, yoga, or even walking (which is a severely underrated exercise). Stretches. Keeping the soft tissues in your lower limbs can help relieve painful symptoms, and also prevent the condition from becoming a recurrent issue. 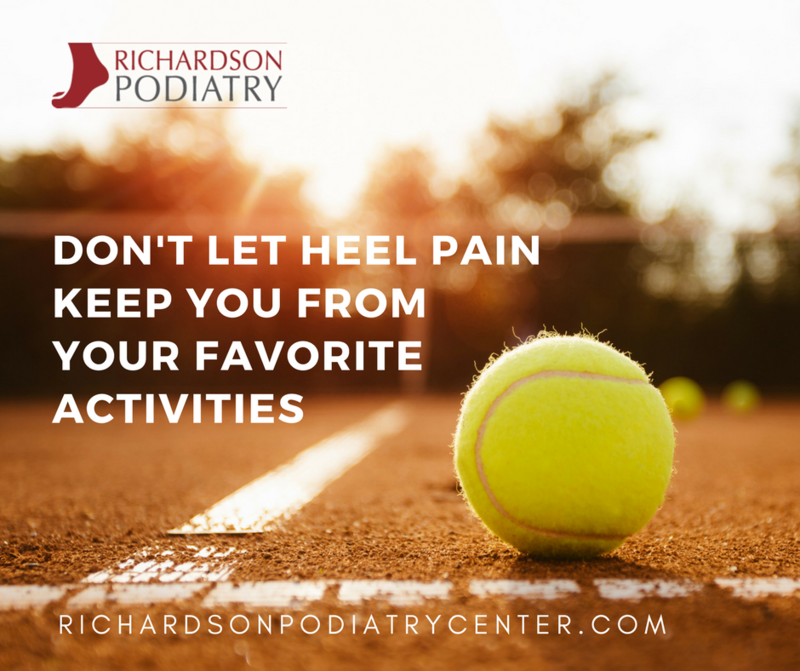 For professional heel pain treatment—so you can perform your favorite activities—come to Richardson Podiatry Center. We’ll diagnose the source of your pain and then develop an effective treatment plan to address it. Call us today at (972) 690-5374 for more information or to schedule an appointment!